Aim: The aim of this study was to evaluate and compare the microleakage of various glass-ionomer restorative materials. Materials and Methods: A sample size of 60 noncarious permanent teeth was taken for the study. Standardized Class V cavities were made on the buccal surface of the tooth. Samples were divided into three groups as follows: Groups 1, 2, and 3 containing 20 teeth in each group and restored with GC Fuji II, GC Fuji IX GP, and GC Fuji II LC, respectively. Samples were then subjected to thermocycling and later on immersed in methylene blue dye for microleakage assessment. The microleakage assessment was done using stereomicroscope (Leise company). Data collected were statistically analyzed. Results: GC Fuji II exhibited maximum microleakage, followed by GC Fuji IX GP and was minimum in GC Fuji II LC. Conclusion: GC Fuji II LC showed least microleakage and thus can be recommended as the restorative material of choice for pediatric patients. Esthetic dentistry has shown considerable progress in the past few years, leading to the development of a number of improved restorative materials. The longevity of restoration is largely dependent on the maintenance of a good marginal seal. Marginal seal is mainly defined by microleakage which is “the clinically undetectable passage of bacteria, fluids, chemical substances, molecules, or ions at the restoration/tooth interface.” It may be the precursor of secondary caries, may promote tooth discoloration, staining of restorative margins, adverse pulpal response, postoperative sensitivity, and even hasten the breakdown of the filling material. The glass-ionomer cement (GIC) introduced by Smith in the late 1960s, and popularized by Wilson and Kent in 1972, caught the attention of researchers and practicing dentists because it was reported to form chemically adhesive bonds to the tooth structure, thereby reducing the need for retentive cavity preparation. Furthermore, it has exerted cariostatic action due to the slow release of fluorides and was biocompatible with pulpal tissue. However, lack of strength, moisture sensitivity, and poor esthetics in conventional GIC has limited their use as restorative materials. Thus, conventional GIC was modified, and resin GIC was introduced by Mathis, Ferracane in 1989. These resin-based materials were light cured and thus have the advantages of longer working time, less sensitivity to water during setting and were more convenient to use. The new generation of glass ionomer, GC Fuji IX GP, was developed by GC Corporation Tokyo, Japan, in 1990s. It is a highly viscous material which has good adhesion to tooth surface, has adequate strength, and can be finished and polished in one visit. Hence, the present in vitro study was undertaken to evaluate and compare the microleakage of various GICs. This study was conducted in the Department of Pedodontics and Preventive Dentistry, D. J. College of Dental Sciences and Research Center, Modinagar, in collaboration with the National Botanical Research Institute, Lucknow. Sixty noncarious permanent molar teeth extracted due to periodontal reasons were used in the study. Teeth with developmental anomaly and fractured during extraction were excluded from the study. These teeth were collected and stored in the normal saline at room temperature for the entire duration of the study. Standardized Class V cavities, measuring 3 mm in length, 2 mm in width, and 1.5 mm in depth, were made on the buccal surface of the tooth, 1 mm above the cementoenamel junction with straight fissure diamond bur using a high-speed water-cooled handpiece. The samples were randomly divided into three groups as follows: Group 1 was restored with GC Fuji II; Group 2 was restored with GC Fuji IX; and Group 3 was restored with GC Fuji II LC. The samples were then stored in normal saline at room temperature for 24 h. Further, they were subjected to thermocycling for 250 thermal cycles between 5°C and 55°C in water bath to simulate oral conditions. After thermocycling, the apices of teeth were sealed with sticky wax, and 1-mm wide zone around the margin of restoration was painted with nail polish to prevent the penetration of dye from any other area. Later on, all teeth were immersed in 10% solution of methylene blue dye for 24 h and subsequently sectioned in buccolingual direction through the center of the restorations with a slow speed water-cooled diamond disc. Finally, they were visually examined for dye penetration along cavity walls under stereomicroscope at magnification of ×40. The extent of microleakage was evaluated and recorded according to the depth of dye penetration scores given by Ajami et al. 2007 [Figure 1]. Data were tabulated and subjected to statistical analysis. When the mean values of microleakage of different groups were evaluated, it was found that GC Fuji II (Group 1) showed highest microleakage which is 4.75 ± 0.444, followed by GC Fuji IX (Group 2) which is 2.30 ± 0.865 and were the lowest in GC Fuji II LC (Group 3) which is 1.05 ± 0.605 [Table 1]. When intercomparison of microleakage was done, the P value was found to be significant for all the groups using the Dunnett's test [Table 2]. There is a constant search for the material and technique that ensures adhesion to the tooth structure to minimize the leakage potential. The maintenance of a marginal seal over a long period is extremely important for avoiding or at least decreased clinical problems such as the discoloration of margins due to microleakage and secondary caries. Keeping this in mind, the present study was designed to evaluate the microleakage in various GICs. On doing statistical analysis of the data obtained, it was observed that the mean score of microleakage of GC Fuji II was higher than the GC Fuji IX GP and GC Fuji II LC. Our results are in accordance with the studies done by Davidovic et al., who did an in vitro study to evaluate microleakage of GIC restorations and concluded that degree of microleakage with GC Fuji II LC was less than GC Fuji II and Rekha et al., 2012 who did an in vitro study to evaluate tensile bond strength and microleakage of conventional GIC, resin-modified GIC and compomer, and it was found that Fuji II LC showed less microleakage than compomer and Fuji IX GP. The initial setting time of GC Fuji II is 4–8 min, and final setting occurs within the next 24 h. During the setting of GIC, calcium ions are rapidly released and form primarily calcium salt bridges between polyacrylate chains within the cement. This reaction needs longer duration for cement to set completely. Such long duration leads to susceptibility to both water uptake and water loss during setting reaction leading to the dissolution of the matrix-forming cations and anions to the surrounding area. Both desiccation and contamination compromise the integrity of the material. If water is lost, due to desiccation, the reaction stops and surface crazing occurs. On the other hand, early moisture contamination results in loss of substance as well as reduction in physical properties and increases microleakage in restorative materials. Thus, in both the cases, the bonding between tooth structure and restorative material gets compromised. Thus, we can safely assume that this prolonged reaction that occurs in GC Fuji II could be the reason for higher microleakage observed in it. GC Fuji IX showed less leakage than GC Fuji II because the setting time of GIC Fuji IX is 2 min 20 s which is faster than setting time of GC Fuji II. Moreover, it is highly viscous because of finer glass particles, anhydrous polyacrylic acids of high molecular weight and a high powder to liquid mixing ratio which is 3.6:1. These properties may be responsible for GC Fuji IX showing good marginal seal. GC Fuji II LC showed least microleakage among the other restorative materials examined. The better sealing produced by resin-modified glass ionomer is as a result of the formation of resin tags into the dentinal tubules and the dual setting mechanism of resin-modified glass ionomer ensuring a more complete hardening of the material and instant set property. Resin-modified glass ionomer cements show higher bond strength to dental hard tissues than conventional materials, they exhibit variable results in microleakage tests. Thus, concluding that GC Fuji II LC presents a better marginal integrity in comparison to GC Fuji IX and GC Fuji II. However, further studies are required to authenticate these results. The properties such as longevity of restoration and strength along with marginal adaptability should be clinically evaluated with further studies. When intercomparison of microleakage in terms of dye penetration score was done for various GICs, the results were found to be significant. This in vitro study was conducted in the Department of Pedodontics and Preventive Dentistry, D. J. College of dental sciences, Modinagar, in collaboration with the National Botanical Research Institute, Lucknow. Kidd EA. Microleakage: A review. J Dent 1976;4:199-206. Bona AD, Pinzetta C, Rosa V. Effect of acid etching of glass ionomer cement surface on the microleakage of sandwich restorations. J Appl Oral Sci 2007;15:230-4. Suresh KS, Nagarathna J. Evaluation of shear bond strengths of Fuji II and Fuji IX with and without salivary contamination on deciduous molars – An in vitro study. Arch Oral Sci Res 2008;45:78-81. Abd El Halim S, Zaki D. Comparative evaluation of microleakage among three different glass ionomer types. Oper Dent 2011;36:36-42. Ajami B, Makarem A, Nikenjad E. Microleakage of class V compomer and light cured glass ionomer restoration in young premolar teeth. J Mashhad Dent Sch 2007;31:25-8. 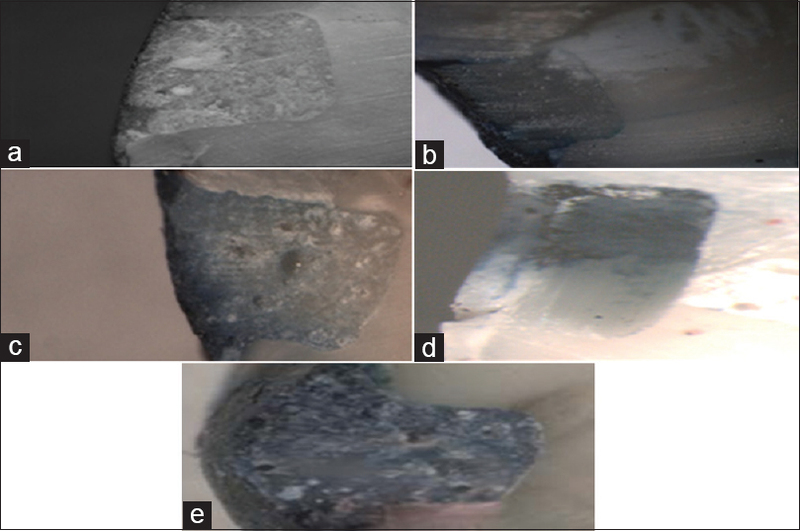 Mali P, Deshpande S, Singh A. Microleakage of restorative materials: An in vitro study. J Indian Soc Pedod Prev Dent 2006;20:211. Castro A, Feigal RE. Microleakage of a new improved glass ionomer restorative material in primary and permanent teeth. Pediatr Dent 2002;24:23-8. Davidovic L, Tomic S, Stanojevic M, Zivkovic S. Microleakage of glass ionomer cement restorations. Stomatol Glas Srb 2009;56:78-82. Rekha C, Varma B, Jayanthi. Comparative evaluation of tensile bond strength and microleakage of conventional glass ionomer cement, resin modified glass ionomer cement and compomer: An in vitro study. Contemp Clin Dent 2012;3:282-7. Davidson CL, Major IA. Advances in glass ionomer cement. Journal of minimum intervention in dentistry 2009;2:3-15. Hallett KB, Garcia-Godoy F. Microleakage of resin-modified glass ionomer cement restorations: An in vitro study. Dent Mater 1993;9:306-11. Anusavice KJ. Phillips' Science of Dental Materials.11th ed. St. Louis: Elsevier publications;2007. Masih S, Thomas AM, Koshy G, Joshi JL. Comparative evaluation of the microleakage of two modified glass ionomer cements on primary molars. An in vivo study. J Indian Soc Pedod Prev Dent 2011;29:135-9. Cho SY, Cheng AC. A review of glass ionomer restorations in the primary dentition. J Can Dent Assoc 1999;65:491-5.